Roof mounted are the most common, although they are more difficult to maintain. Figure 2: A typical side-draft cooler. The only problem associated with the combination system is that refrigeration ducts are often too small to move the amount of air required by evaporative coolers. This causes less airflow and more noise. Also, combined systems require that a damper be installed to separate the units. Otherwise the refrigerated air will escape through the evaporative cooler and the moist air will corrode the refrigeration system. In smaller, open homes, cooled air can be blown into a central location without ductwork. Evaporative coolers work by cooling fresh air from outside that replaces the warm air in the house. Thus, you need to open windows or doors to let the warm air escape. If this presents a security concern for you, you may want to think about installing ceiling vents. 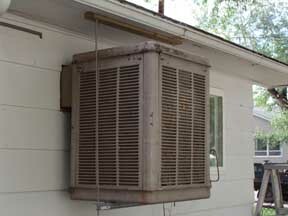 Figure 3: Mounted coolers are connected to ducts that bring cooled air into your home. Warm air escapes through open windows or ceiling vents. Your evaporative cooler will also need to be plugged into a nearby 120 volt wall outlet. Be sure that there is an electrical disconnect for your safety during maintenance. There is no special wiring required (unlike air conditioners that often require a high amperage power circuit). 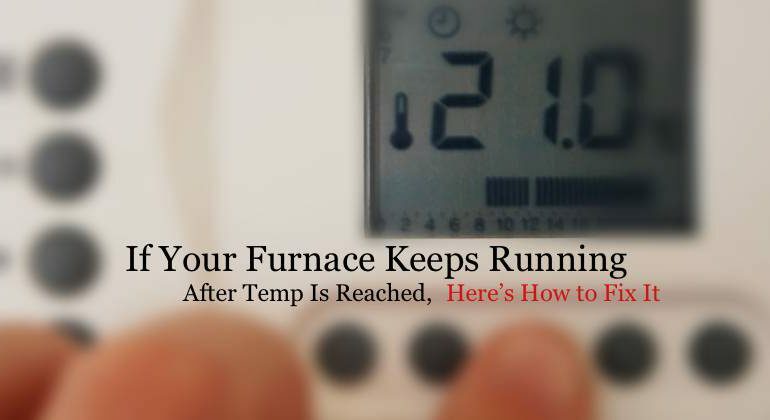 You should also install a low voltage thermostat that will turn the cooler on and off automatically. Finally, be sure that there is an accessible cooler water shutoff valve. Coolers should be installed at least 10 feet away from or 3 feet below plumbing vents, combustion appliance flues, clothes dryer vents, or exhaust fan vents. Keep animals, yard chemicals, and fuels and solvents away from the cooler vicinity. Provide a minimum of 3 ft of clearance to any side of the cooler that requires access for maintenance. 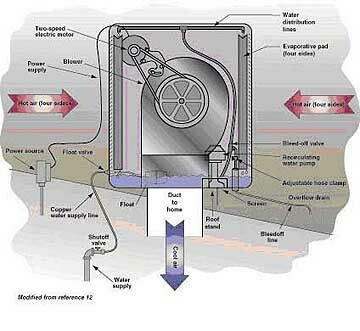 When you install your cooler, check the float valve setting after one pump cycle. This way you can make sure that the float isn’t set too high, which would cause the reservoir of water to overflow. Sources: “Installing and Maintaining Evaporative Coolers” Home Energy Magazine Online.